Mine! 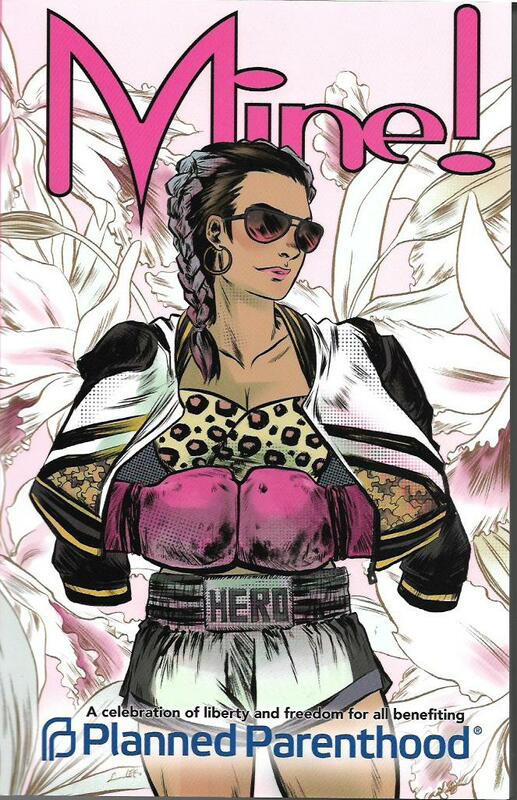 [ComicMix; $24.95] is an anthology that celebrates “liberty and freedom for all” and benefits Planned Parenthood. All profits from the sale of the book go to Planned Parenthood. Just to put my personal bias up front, I donate to the organization several times a year. It’s an important resource for women and men alike and has been inaccurately, unfairly demonized by the right as an abortion clinic and no more. Since you’re reading this column, I know you’re intelligent enough to know the facts. Indeed, you know that many of Planned Parenthood’s services save lives, including those of the mothers who want healthy babies. Moving on to the anthology itself, Mine! features hundreds of pages of comics by some of the best creators in the business. If the book had page numbers, I could tell you exactly how many pages of story and art it contains. But it doesn’t and I’m too lazy to count them myself. Question. Can anyone explain to me why books like this don’t have page numbers? I would have thought that to be an automatic function in the design process. Is it somehow more expensive to have those page numbers? I am sorely confused. Editors Joe Corallo and Molly Jackson gathered over 100 creators to create this anthology. There are huge names on the roster, such as Neil Gaiman, Gail Simone, Mark Waid, Denny O’Neil, Trina Robbins, Amber Benson and Louise Simonson. There are lesser-known talents whose recent work I’ve enjoyed. The contributions discuss history and a great many current issues. Micha Cruz kicked off the anthology with a nice summation of what Planned Parenthood does. Niki Smith’s “Epidemic” shows the lethal consequences of clinics being shut down. Glenn Greenberg and Nick Guarracino celebrate the everyday heroism of the Planned Parenthood providers. Devin Grayson and Eugenia Koumaki focus on often-crazy misinformation kids share with one another. Neil Gaiman’s moving prose describing a real-life event is made all the more poignant by Mark Wheatly’s illustrations. Kelsey Hercs and Jessi Jordan team to present a vignette that spans the decades. Those six examples were chosen pretty much at random. There’s so much incredible content in this anthology that it would take two columns just to list all the creators and their works. Mine! is my pick of the week. It’s an anthology to be cherished for the insights it provides as much as for its great comics. I suggest reading several contributions a day, the better to appreciate the works and take in their messages. I’m thinking this book could win an Eisner Award. It surely deserves one. Bettie Page #6-8 [Dynamite; $3.99 each] wraps up the first series of her title with an absolutely delightful adventure involving an artifact from beyond our planet. Writer David Avallone’s handle on Bettie is equally delightful. She’s capable, feisty and crazy quick on her feet and with her brain. She has few inhibitions, but like her real-life counterpart, this Bettie is truly the girl next door with a strong moral fiber. This three-issue story makes use of all of that and includes terrific supporting characters and villains. Visually, the Joseph Michael Linsner covers are simply beautiful. 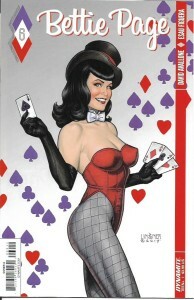 I like the Scott Chantler alternate covers as well, but Linsner’s Bettie are the stuff of dreams. Interior artists Esau Figuera and Matt Gaudio tell the story well. The depiction of Bettie is as glamorous as her classic photos and pin-ups. Page remains the queen of pin-up art and photography and continues to inspire modern practitioners of that craft. Bettie Page Vol. 1 [$17.99] is scheduled to be released in May of this year. From the ordering information on Amazon, it doesn’t seem to include all eight issues. I’m hoping that’s in error because I’d love to have the entire first series in one volume. Almost as much as I’m hoping for a second Bettie Page series in the near future. I’ve got it bad for that gorgeous dame. One of the all-time greatest giant monster movies is Them! . Spawned by atomic bomb tests, giant ants arise from underground and begin preying on humans. The film has exciting monster moments and moving human stories. I loved it as a kid and I still love it as an adult. It has held up all these decades since its initial release. I still watch it about once a year. Ant Wars [Rebellion; $12.04] also has giant ants. That 15-chapter serial originally appeared in the weekly 2000 AD #71-85 [from July 1 to October 7, 1978]. Written by Gerry Finley-Day with art by Jose Luis Ferrer and others, these enormous bugs hail from the Brazilian forest. Experimental pesticides designed to kill more common ants instead increased their size in monstrous fashion. This serial was classic 2000 AD weird adventure. I’d seen a chapter here and there, but this is the first time I’ve read it from start to finish. It’s an exciting story. You’ve got an army captain, the only member of his unit to survive their first encounter with the ants, teaming with a “semi-civilized Indian” called Anteater. Because ants are a delicacy for his people and he likes to munch down on normal ants. This horrifies the army captain, but he knows he has a better chance of escaping the jungle to warn the authorities with Anteater at his side. The death toll is high, the killings are brutal and there’s no guarantee mankind comes out on top. Neither the writing nor the art is likely to win any awards, but this serial was a solid piece of work. 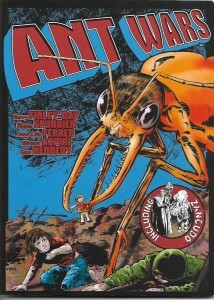 Ant Wars also contains “Zancudo” by Simon Spurrier with artist Cam Kennedy. From Judge Dredd Megazine #231-233 [circa 2005]. It’s not nearly as entertaining as “Ant Wars,” replacing the giant ants with giant mosquitos. It’s so-so at best. Take comfort in knowing “Ant Wars” alone makes this collection a excellent buy.